Have you ever wanted to create an easily retrievable or editable archive of your valuable hand-drawn architectural & engineering drawings? Or perhaps, a library of components or details from your precious blueprints? We, at DTech Advanced Technology can help you. Allow us to support you from our fully-equipped office. Our professional draftsmen can produce drawings tailored to your requirements. By taking advantage of our service, your own personnel are able to concentrate on more crucial project . We have the capacity to handle bulk turnkey projects. And being customer focus, no job is small for us. Our mission is to meet the needs of our Clients through delivery of quality products at a competitive price and on the scheduled time. 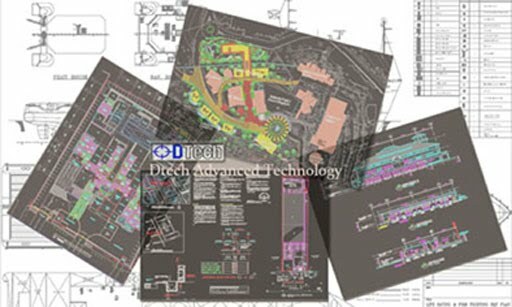 We ensures that our finished CAD drawings will undergo vigorous checking before submitting them. And lastly, we will strive hard to be the choice drafting service provider in the architectural and engineering industry through continous innovation and outstanding customer service. When we are contracted to do a job, we guarantee that your drawings will be treated with high-level of confidentiality. Drawings are accessed on a need-to-know basis. Physical Security - we pledge that your drawings and the ideas they contain will receive the highest degree of security and protection whilst in our possession. Your drawings are delivered to you in a sealed water-tight plastic wrapper and will be shipped in appropriate parcel packages by one of the leading couriers, such as United Parcel Service, Federal Express or DHL. Internet Security - If you choose to transfer your drawings over the internet, we will use all the feasible methods of providing security. The servers and workstations use by our team are firewall protected. Your files located on our internet-accessible server is password-protected. The data will be kept for 3-months as a back-up in the event that you lost your copy. We will honor all international copyright laws and we will protect your work from unwarranted and unauthorized duplication.